We will try to resolve any problems on soil contamination. 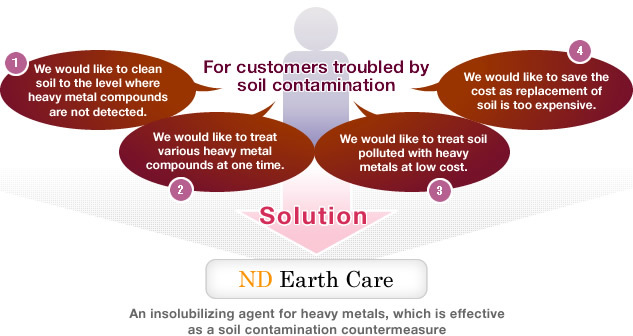 "ND Earth Care" is an innovative insolubilizing agent to stabilize heavy metals and prevent them from being dissolved with even a small amount, by immediately undergoing a chemical reaction with various types of heavy metals contained in soil or fly ash, and forming insoluble chemical compounds. Thanks to its extremely high reactivity with heavy metals, “ND Metal Clear” enables you to treat contaminated soil safely at low cost. The value of your property will decline. Various restrictions will be imposed when you deal in real estate. The utilization of land will be adversely affected. Risks to human health may be caused due to contamination. Your company should bear social responsibility. Your corporate image will be tarnished. 1.We would like to clean soil to the level where heavy metal compounds are not detected. 3.We would like to treat soil polluted with heavy metals at low cost. 4.We would like to save the cost as replacement of soil is too expensive. We would like to clean soil to the level where heavy metal compounds are not detected. 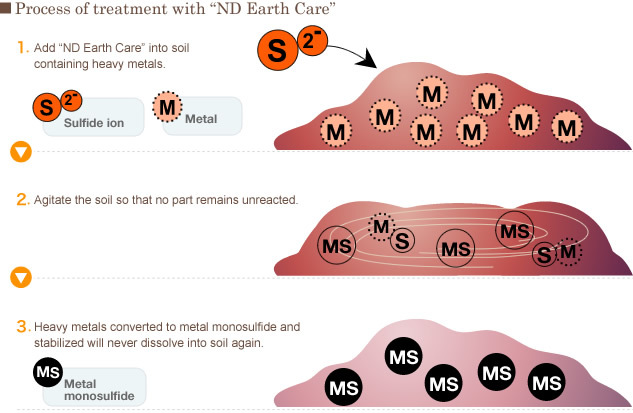 "ND Earth Care" immediately undergoes a chemical reaction with heavy metals in soil and forms insoluble chemical compounds. Accordingly, you can clean soil to the level where heavy metal compounds are hardly detected. The reactant is stabilized. Besides, heavy metals will never dissolve into soil again. "ND Earth Care" undergoes a chemical reaction with any kinds of heavy metals, and then stabilizes and insolubilizes them. Thanks to such property, even a small amount would suffice to insolubilize various types of heavy metals. Besides, it is effective for complex contamination of heavy metals. Furthermore, this is a liquid-type agent, which you can easily deal with. The processing flow is simple. And the volume of treated soil does not increase after the treatment. We would like to treat soil polluted with heavy metals at low cost. Thanks to its extremely high reactivity with heavy metals compared to conventional chelating agents, a small amount is enough to clean soil to the level where heavy metal compounds are hardly detected. Besides, because "ND Earth Care" is effective for various types of heavy metals, you don’t have to prepare different types of agents and can save the cost. We would like to save the cost as replacement of soil is too expensive. The cost for soil excavation is expensive. However, this "ND Earth Care" enables you not only to decrease the amount of dissolution below the level specified by the Environmental Quality Standards for Soil Contamination, but also to save the cost as you don’t have to dispose of the treated soil.